It is worth taking a step back and taking a good look at your staff? Are they all efficient? Happy? Do they have the best intentions for your business at all times? Or do you have a bad apple in your workplace? 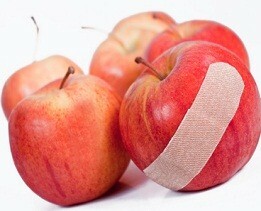 ‘Bad apples’ can significantly reduce productivity by destroying morale. One employee can change the whole atmosphere of a workplace from a happy and cooperative one to one of misery, harassment, back stabbing and avoidance behavior. Take an office work environment where the boss often spent time out of the office drumming up business. He left the employees generally to their own devices. One senior worker took it upon himself to supervise and manage the staff. The senior worker did not have the personal skills required to effectively manage staff and also took a liking to a more junior female employee. His management techniques for the majority of the staff involved stand-over techniques. He would sit in his office and yell expletives directed at members of staff, within the earshot of clients and staff alike. The one junior female employee to which he had taken a liking, was treated more favorably; however, she would often be cornered in her office and was made to feel uncomfortable by his constant approaches. Complaints were made to the boss. However, he found it easier to avoid the situation, as he just did not know what he should do, and was scared that if he did do something, he would expose himself to the risk of a claim or a disruption to his office and business. The boss did not realise that by not dealing with the issue, the effects on his business were far greater than he feared. Not only did he lose the promising junior female employee, but she and another staff member made a claim against the business for a large sum of money. Eventually the boss also had to ask the senior employee to leave. Many employers sit on their hands for fear of what might happen if they discipline or remove problem employees. However, sitting on your hands as an employer can put you at just as much, or possibly more, risk than a dismissal or disciplinary action would. Courts are more than willing to make a ruling against an employer who has allowed a negative or discriminatory culture to develop in their workplace. The damages a Court can order are significant. Employers need to know how to go about the process of disciplining or removing an employee properly. By having policies and procedures surrounding behavior and discipline in place, and following them, employers could relieve much of the internal pressure and get on with working the business. Sometimes it is necessary to take a stand, for your business, and for the well being of your workers.